I am in total awe of pinstripers at every event that I attend. They are a dedicated bunch of characters that always have their heads down and are hustling from the time the event opens until close. Most come with a box in hand, and like magicians, they have a few tricks up their sleeves. The name of the game is to listen to the customer and produce a design that is worthy of their mindset. Jeremy Pedersen from Relic Kustoms is one of many pinstripers I have come to know. Our first encounter was back in 2010 at The Broken Spoke Campground in Sturgis, SD. Jeremy was a member of the Limpnickie Lot and shared a booth with Jordan Dickinson from Union Speed and Style. Both Jeremy and Jordan worked from sunrise to midnight and beyond during the rally. Jeremy was laying down stripes on helmets, tanks, and custom motorcycles, while Jordan was creating seats and bags out of his man-made workshop. I was extremely impressed by how they never slowed down. Fast forward to this year's Hippy Killer Hoedown, where Duane and I were vending next to Jeremy and his lovely family. Jeremy worked on a few projects during the day and had the opportunity to pinstripe a few cars by the end of the event. He graciously offered to help me with the Born-Free 9 ChopCult / Biltwell Lane Splitter giveaway. Over the years Biltwell has been kind enough to provide a helmet, and I find a painter to add some color. Jeremy hit it out of the park with a one-off paint job that was won by ChopCult member Darin Gilchriese. Relic Kustoms is internationally known for hand-painting, pinstriping, lettering, signs, designs, and artwork. 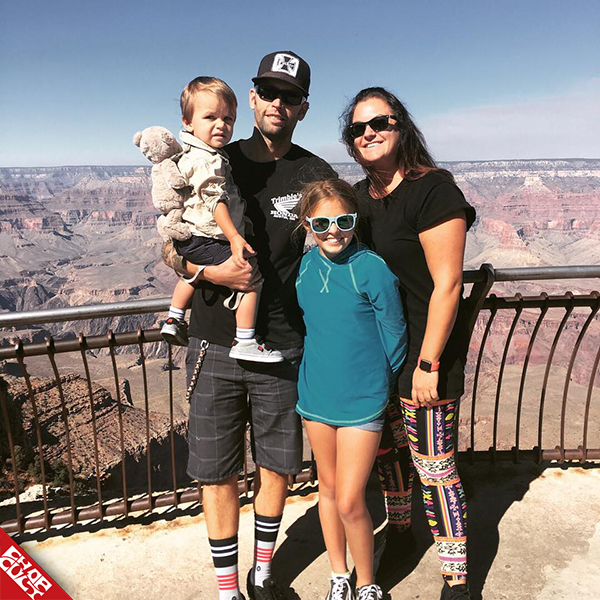 Jeremy is always searching for the next big project all the while enjoying quality time with his family. I recently asked him a few questions and here's what transpired. Enjoy! JP - My name is Jeremy Pedersen. I was born and raised in Austin, Minnesota and currently live in Lake Havasu, AZ. I am happily married to Krystal, and we have two beautiful children, Jayden and Jaxon. Has art always been a part of your life? JP - As far as I can remember, yes, it has. When was the first time you picked up a brush? JP - Somewhere around 2002... I tried a few different paints and brushes, all completely wrong... Then, I started to do some serious research, found a couple of Mack striping brushes and a big can of OneShot. After that, it was non-stop practice. What is your go-to brush and why? JP - I have probably acquired well over 100 brushes. There are so many different types and styles of brushes out there. Especially right now, it seems as if everyone is developing a signature series brush. Something just a little different from all the others. And I do like to try them all, to see how they work and feel, in my hands. But, I always go back to a Mack 00 (Series 10). What paint do you prefer to work with and why? JP - This all depends on the project... And I have used most of the paint products on the market. But, the majority of my pinstriping, lettering and sign work is done using OneShot. When did you start Relic Kustoms and what types of services do you offer? You and I met at the Limpnickie Lot in Sturgis a few years back. Do you feel the Lot helped your brand grow? Do you think it should make a comeback? JP - The Lot gave me an opportunity to meet some truly talented and amazing people within the Motorcycle Industry. And many crazy/good times were had at the events we attended. Did the Lot help grow my business??? No. The Lot opened my eyes to the good & bad within the Industry. I've always tried to place myself in front of situations that could benefit my artwork. Vending at certain shows sometimes helped. Being involved in art shows pushed me to expand my capabilities. But, having real friends & loyal customers that truly appreciate my work enough to recommend it to others, has always been the most benefitting factor. What does it mean to you to take part in the Pinstriper’s Reunion at the Grand National Roadster Show? JP - It was an absolute honor to be a part of a group of such talent and respect. I was blown away when I first got that invitation. Being among all of the knowledge, stories, and camaraderie, it doesn't get any better than that. You've attended many events over the years. What are some of your favorites? - Bottrop Kustom Kulture / Kustom Kulture Forever -- The koolest people from all over Europe, German beers & schnitzel. - Vintage TorqueFest -- The Wells family are amazing people. - Hunnert Car Pileup -- when it was in Morris, IL. - Sturgis 2010 Broken Spoke County Line- those that were there know. Do you offer complete paint jobs or prefer to pinstripe? JP- I used to do it all... Now that I have moved to Lake Havasu, I have scaled back in attempts, in order to concentrate more on the hand-painted styles of artwork, pinstriping, lettering, and sign painting. You donated your time and talent (thanks again) for ChopCult's helmet giveaway during Born-Free. Can you tell us how you painted the helmet? JP- At last year's Hippy Killer HoeDown, you approached me with the opportunity of painting a helmet for ChopCult / Born Free. Biltwell then sent me a brand new, solid white, LaneSplitter. I choose to use a very simple color palette (two colors) to layout a design of creatures from Norse Mythology, rune symbols, and knotwork. All of the linework and stippling was done with OneShot paint and three different brushes. Total time, from concept to completion, is somewhere in the range of 40-60 hours. What do you consider a perfect day? JP- I enjoy way too many activities... The perfect day is just being in the moment with the people in your life. What music do you like listening to while you work? JP - Damn near everything. Pandora is always on shuffle. Music is like coffee. Keeps you going. JP - My family. They have always been very supportive and patient, along with this journey. It has provided many remarkable experiences. But, it has also taken away significant amounts of time... So, I thank you! How can our readers learn more about you? JP - I tend to share most of my work on Facebook and Instagram. Thanks! Love the Triumph tool box, Growing up as a kid there was a local guy who was legendary called "The Beard" and on many of his pinstripe jobs he would add in little items for people to find, sometimes stick figures doing naughty things. But the current guy who has been consistent for 2 or 3 decades here in PDX is Mitch Kim. Amazing talent. Saw him freehand a PT cruiser that was epic. I have some handpainted Triumph stuff he did some years back. The tiger like on your toolbox but was twisted like he was changing direction and attacking. Maybe attend the ONEMoto show here in PDX in Feb? Beers on me.